Phoebe Vernier Cáceres looks fondly at her chickens, “the girls,” as she lets them out of their wisteria-draped coop to peck and scratch. Although her parents grew up in the country, Vernier Cáceres spent much of her life in San Francisco. After raising two sons as a single mother, she was able to move to Cotati, and grow some of her own food, keep pets and raise chickens. And to offer two unique services. The first is chicken-sitting. Want to take a vacation but your feathered friends need care? Give her a call and she’ll treat your poultry pals as kindly as she cares for her own. The second service, classes in chicken butchery, addresses the inevitable: what happens when hens age and no longer produce well, the flock becomes too large or there are too many roosters. Billing herself as the Chicken Woman, 51-year-old Vernier Cáceres teaches people how to “harvest” their chickens. She knows first-hand how difficult that can be. For several decades Vernier Cáceres made her living as flamenco dancer La Fibi, leading a successful dance company and school. A flamenco-caused neck injury ended her career and threw her into a depression. She returned to college and will graduate next year as a certified medical technician. Hew new artistic outlet is singing in gospel choirs. She also has time for a garden, a pair of cats and a coop that’s held as many as 17 plump chickens. It’s because of the chickens that she saw the need for her services. Though Vernier Cáceres had visited Italian relatives as a child and her auntie had harvested chickens and rabbits, she had never seen it done. Learning how was a labor-intensive process. 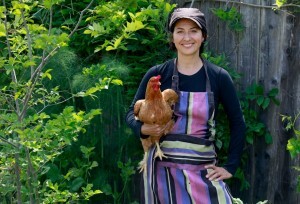 She sought out others who raise chickens and asked for advice. She went to fairs, talked to chicken exhibitors, read and researched. “The Internet helped me immensely,” she said. “I had to search to find videos from Africa, Europe and Asia” that showed the old methods her grandmothers might have used. The time-honored neck-axing method gave her pause. While she can do it, she’s troubled by the headless body running around. “I wasn’t happy with some of the methods I saw on videos. One man broke a head off, which I didn’t like,” she said, preferring to hold the chicken gently but firmly in her lap. “A lot of grandmothers did that,” she said. “Chickens are calm creatures if held and petted. Then, with an extremely sharp knife, you quickly and calmly slice their throat, hold the head and let them bleed out. While mastering the skills, Vernier Cáceres worked at Petaluma’s Aqus Café and talked with customers about what she was learning. Some had small backyard flocks and said they couldn’t bring themselves to butcher their chickens. Six months ago, she put together a small packet and began offering a three-hour class, charging $25 per hour per person. So far she has worked with 20 couples and hopes that by showing them how to do it, they can pass along the knowledge. 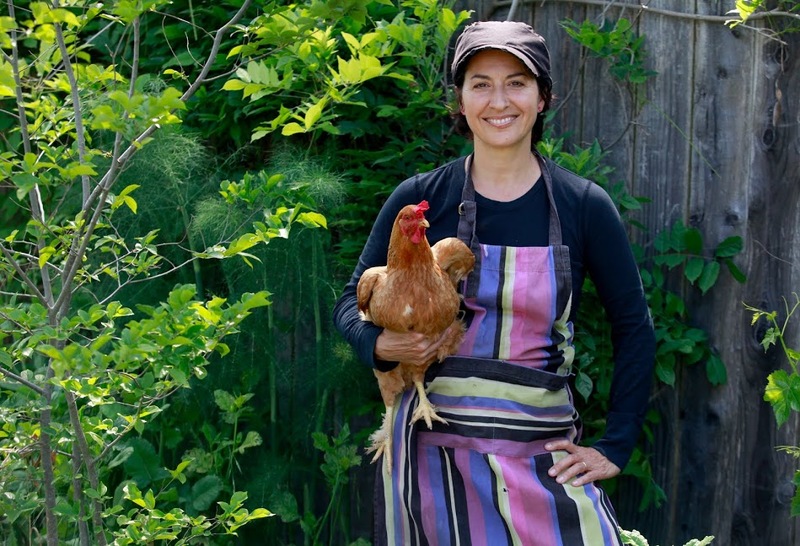 Now that an increasing number of people are raising chickens in backyard coops, she thinks it’s time to slow down, re-learn and understand this part of the life cycle. More info is available. Contact Vernier Cáceres at phoebevernier@gmail.com or visit thechickenwoman.weebly.com.